Frank Frazetta is a well-known artist of science-fiction and fantasy scenes. He has created versions of popular characters such as Buck Rogers, The Hobbit and Conan the Barbarian. Conan the Barbarian is the latest character to be featured in the Frank Frazetta Legacy Collection of silver rounds. 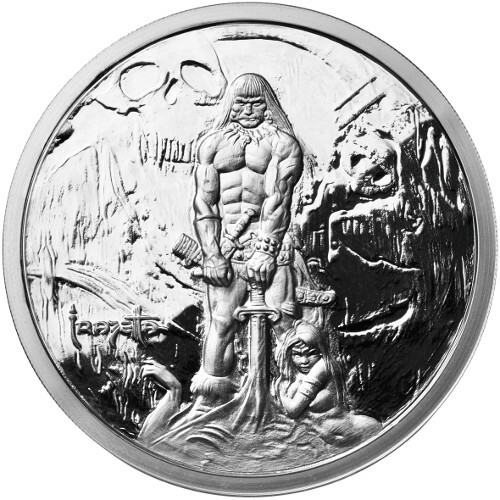 The 1 oz Proof Silver Frank Frazetta Legacy Collection Barbarian Round is now available at Silver.com. Ships in a protective plastic capsule with a Certificate of Authenticity. Third design in the Frank Frazetta Legacy Collection. Limited availability of just 10,000 silver rounds in total! Consists of one troy ounce of .999 fine silver. Edge serial number. Designs recreated by Luigi Badia, an Italian sculptor. Authorized by Frazetta’s son, Frank Jr. The Barbarian design is one of Frazetta’s most well-known pieces. The Barbarian design shows Conan the Barbarian with a sword that is connected to the Earth. A woman clutches his ankle, and body parts can be seen near his feet. The muscular barbarian stands tall and proud. The Barbarian is captured at a sullen moment on the reverse of the latest round from the Frank Frazetta Legacy Collection. The obverse of this round is the same as the obverse of all the other rounds in the series. Frank Frazetta’s image graces the front of these rounds, along with his name, year of birth and year of death. The seal also shows proof that the artwork on the round is that of Frank Frazetta. The edge of each round has a unique serial number engraved into it. You will also find information on the metal content, weight and purity of the round on the edge. 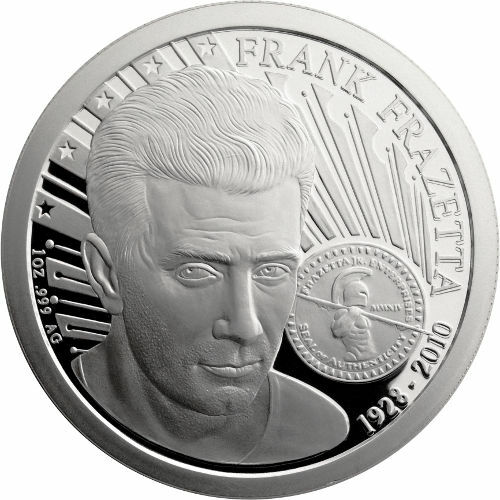 Each of the 1 oz Proof Frank Frazetta Legacy Collection Barbarian Silver Rounds in this listing comes in a shiny, proof finish. This finish makes the silver look mirror-like. All of these silver rounds will ship in a plastic capsule. The plastic capsule will protect the design and finish of the round as it travels to you and is stored in your home. You will also receive a Certificate of Authenticity that has a unique serial number that matches the one on the edge of the round. Please direct any questions you might have about Legacy Collection silver rounds to a Silver.com associate at 888-989-7223. You can also connect with us online using our live web chat or email features.